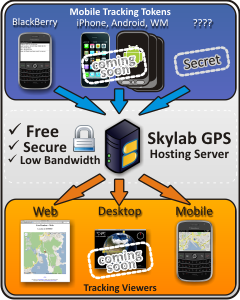 The LiveTracker mobile client can be installed on any BlackBerry® mobile phone and sends out location data to our Skylab GPS server. Free: No hooks or hidden fees for personal use. Worldwide GPS: works all over the world. Background Tracking: just works - 24/7. 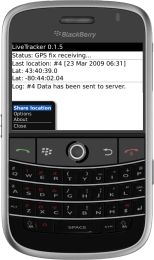 Remote Control: start/stop tracking by SMS. 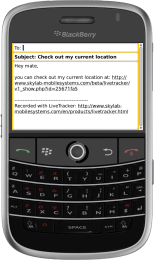 Easy Sharing: Send tracking links via EMail, PIN, SMS, MMS. Live Web Tracking: View location on maps. 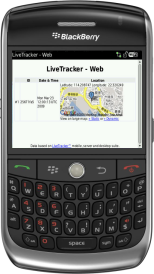 Free Download: LiveTracker Mobile is available for free non-commercial use - download. 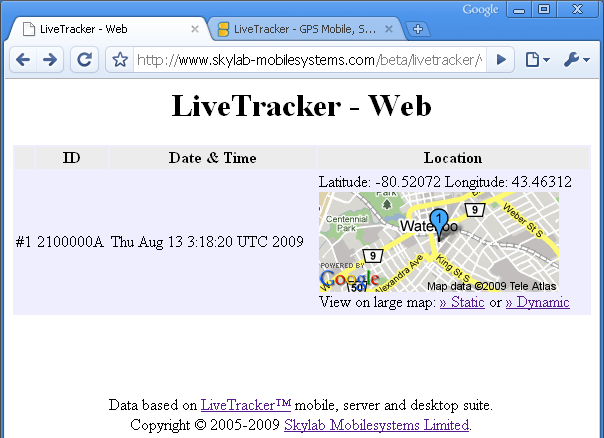 Background Tracking: Start LiveTracker and it sends the GPS location to our tracking server. Automatic Tracking: On device startup GPS tracking can be fired up automatically. 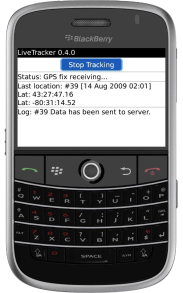 Remote Control: Start and stop GPS tracking on your device by sending an SMS. 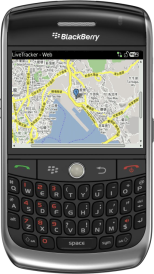 Share Location: Send EMail, PIN, SMS, MMS, Twitter message to your location's map representation. BETA TEST: Due to the early stage of this application please report any bugs to us. Thank you. Tom is tracking himself and shares his location with Greg via email. 1. Sending Location. 2. Share Location. 3. Via EMail or SMS? 4. EMail to Greg. Greg received an email from Tom and can see his buddy's location. 5. Tom's location info. 6. Tom's location map. Greg can also view a map with any desktop browser like shown below. Built-in GPS receiver (via JSR-179 location API). 8110, 8130, 8310, 8330, 8350i, 8500, 8530, 8800, 8820, 8830, 8900, 9000, 9100, 9105, 9300, 9330, 9500, 9520, 9530, 9550, 9630, 9650, 9670, 9700, 9780, 9800 with activated internal GPS. 8100, 8120, 8220, 8300, 8320, 8520 with external Bluetooth GPS receiver. 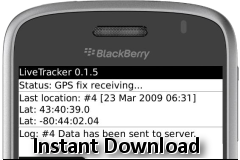 Sends data to GPS server automatically every 5 seconds. Shows current location, time stamp and status on screen. Counts how many GPS fixes have been sent in session. Shows log for server connection status. Share location via: EMail, PIN, SMS, MMS. Twitter account added to Options screen. A Trademark of Twitter, Inc. Allows you to increase or decrease the time span. Example: By increasing the time span from 5 sec. to 60 sec., a position fix will be sent to our server every minute (=60 sec.) instead of the default 5 seconds. This will create about 12 (60 divided by 5) times less data traffic compared to the default setting. So it saves money. You will also see a better battery performance with an higher time span setting. Automatic BES/BIS/MDS connection type usage. Server settings customizable (can not be saved in beta version). 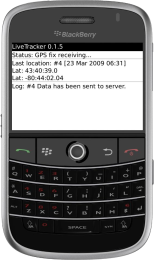 Remote tracking control via SMS. Auto start tracking on device (re)boot can now be activated. Start/stop tracking manually via button. Help screen with description of functions and FAQ-like support. Bug fix: Twitter connection uses BES/BIS too - if activated. Please enter your name and email address. Download files will then be sent to your mailbox. We respect your privacy and we will not share your data. Period.